Easy To Set Up & Maintain! Hydrobuilder.com has the largest selection of plant growing tents online at the cheapest prices. Grow tents come in various sizes from 2ft x 2ft up to 10ft x 20ft. We offer standard & heavy duty grow tents, multi-chamber grow tents and smaller clone & seedling grow tents. Indoor grow tents offer a convenient and practical way to create the ideal environment for your plants. Hydrobuilder.com also offers a huge selection of grow tent accessories. Hydrobuilder.com has a huge selection of grow lights & hydroponics supplies you can use to finish building your grow room. Why grow in a grow tent? Bringing the garden indoors can be incredibly messy. Growing in a grow tent contains the mess of your garden, and creates the ideal environment for your plants. Once you start growing in a tent, you will never look back. 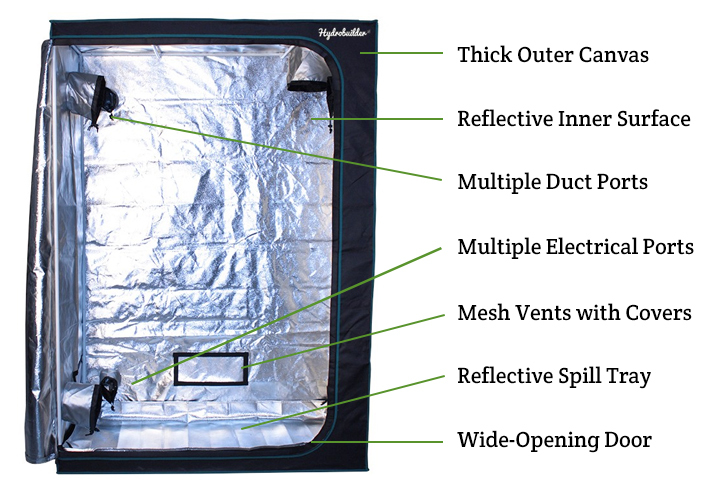 The mylar interior increases the reflective surface area in your grow tent while maximizing the performance of your grow lights. This design insures that no precious light is wasted and your plants are receiving the best light possible. The grow tents' enclosed design keeps unwanted pests such as aphids, flies, and spider mites at bay. Any outdoor grower will tell you how easy it is for pests to infect your plants and how difficult it is to get rid of them. As long as the plants and equipment entering your tent are clean and pest free you shouldn’t encounter any kind of infestation. Read more about why you should use a grow tent. What temperature should your grow tent be? To cultivate the strongest, heaviest plants, you need to set up a very controlled environment. Temperature is one of the most important aspects of growing indoors, and especially in a grow tent. Try and keep temperatures between 70-80 degrees Fahrenheit during propagation and vegging, and lower this slowly as you approach flowering. This will simulate the natural changing of the seasons. Your grow lights, CO2 producers, and dehumidifier will generate a lot of heat in the grow tent. To combat this, use clip on fans and set up a proper ventilation system. To spare you a headache, know that for the most part, more watts equals more heat regardless of what light is producing the watt. Remember this rule: Watts in = Watts out. A 600 watt LED at the wall, will generate around the same amount of heat as a 600 watt HID. Watts does not mean the amount of light produced. For the most part, LEDs and CMH are considered to produce less heat because you need fewer watts to match the amount of light an HID produces — they’re more efficient. Learn more about ways to control grow tent temperature. View our 2018 Grow Tent buying guide. What are the Benefits of Grow Tents? There are a lot of environmental factors that go into growing strong and vigorous plants. You have to control your temperature, humidity, light schedule and light intensity, circulate air, constantly reintroduce fresh air. As you become a more experienced grower, you’ll become a lot more comfortable not only controlling these factors, but manipulating them to grow bigger and better plants. New indoor growers struggle with just trying to keep their environmental factors stable. This process is made simpler with an environment controller, which automates your entire atmosphere. Without a doubt, the main benefit of grow tent growing is they are designed to make creating and controlling these environmental conditions easy. Energy efficient – Grow tents have reflective mylar walls that will improve your lighting efficiency. Easy setup – With grow tents, you won’t have to alter your home by making holes to hang lights, modifying a closet, etc. You will also save time and effort because a DIY setup, while cheap, requires a lot of work to be effective. Separate growing phases – Plants require a different duration of lights on/off depending on their growth stage. This means you can’t mix a plant that’s in flowering with a plant that’s in the vegetative stage. Multi-chamber grow tents make it incredibly easy to have multiple plants all in different growth stages, all in one room. Portable – They are lightweight but extremely durable, and easy to break down and move. Privacy – They keep plants out of sight and can easily fit in a closet or corner of a room. Great for all lights – All grow lights will have different requirements. HID grow lights will need a ballast and reflective hood. LEDs have to be hung much farther away from the plants than fluorescents. Grow tents are designed to work will all popular grow lighting systems. CO2 – Supplementing CO2 is a great way to increase yields. For maintaining high levels of CO2, you’ll need an airtight room so it can’t escape. Grows tents are made to seal plants away and work great with supplementing CO2. Time – Creating a grow tent from scratch will not only require build time, but you will also need to research where you should place ventilation holes, ports for running wires in and out, how to prevent light leaks, etc. What are the different types of grow tents? Here at Hydrobuilder, we carry grow tents for every situation. Regardless of your grow, we have a tent for you! How big of a grow tent do I need? The biggest factor that will go into the height you’ll need your tent to be will depend heavily on which grow lights you are using. It’s common to hang LEDs and HIDs up to two feet over your plants because of their intensity. Fluorescent lights can be much closer, however – within a few inches. You will also need to calculate your grow medium height and the height of the plant. If you’re planning on using one tent for the plant’s entire life cycle then you’ll want a tent that at least 60”. If you plan to use 1000 watts of lights or more it’s recommended to move up to a tent that is at least 7’ tall. A 6’ tent may seem really tall until you calculate your plants’ height, grow media height, how far down the light is required to hang, and distance of light from plants – powerful LEDs may require up to 2’. 4' x 4' and 3' x 3' grow tents are the two most popular sizes because they give a square shape for an even light footprint, and can house 4 to 8 full-size plants. The one problem with square grow tents is they are more difficult to fit into closets. That’s why we offer a wide range of grow tents with different lengths and widths. A 2' x 3' and 2' x 4' grow tent will fit most closets well. Fabric – You will want a durable fabric that is 100% reflective. You can find fire-retardant tents, which hopefully you’ll never need, but it’s a nice feature to have. If you’re worried about light leaks – light getting into your tent – look for a tent that is certified light tight and has strong zippers as they are common culprits of light leaks. Ventilation – The tent should have at least two ventilation holes/flaps for both intake fans and filters and exhaust fans and filters. Stability – Again, your lighting system will play a large part in this, and you’ll want to purchase a tent that can hold the weight of both your lighting and ventilation system. Often growers will test the strength of their tents by testing their own weight first – just be careful not to tip the tent over. Multi-chamber tents – These tents have separate rooms that allow you to perpetually grow year round with just one tent. You can have a flowering plant with a 12/12 light schedule in one chamber and a plant in the vegetative stage with an 18/6 lighting schedule in another chamber. Even smaller multi-chamber plants are great because they can act as an all-in-one vegetative and propagation tent. Or you can have a mother plant in the main chamber and take cuttings from her and clone in the side chambers. For additional help, our most popular grow tents will give you an overview on thread count, the size and number of both the ducting and electrical ports, as well it will show you the recommended wattage for grow lights and CFM required for proper ventilation. 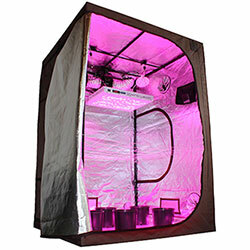 You may find it beneficial to check out our “Grow Tent Kits” category to see how we put together different all-in-one lighting and grow tent packages. This will show you how we match different grow lights and their wattage to different grow tents sizes. It will also give insight on what size ventilation and odor control systems we like based on tent size. Here at Hydrobuilder, we carry all the grow tent supplies and accessories you may need! Grow tents are fairly easy to setup and will come with instructions. You can easily find videos online if you need additional help. For larger tents, it’s recommended to have someone there to help you. Do grow tents need ventilation? You will need a ventilation system in your grow tent. A properly set up ventilation system will control CO2, temperature, humidity, and oxygen which are all vital environmental factors that greatly affect plant growth and development. Are grow tents odor proof? Grow tents also do an exceptional job of containing the smell of your indoor garden. This will maintain privacy and discretion, and prevent the smell of your plants from wafting into other areas of your home. A common ventilation system for grow tents will have: a carbon filter for odor control, ducting, and inline fans for intake and exhaust components. As noted above, the majority of our grow tents will tell you the recommended CFM rating for the tents size. If it doesn’t give you the recommended CFM rating, you can find the number with some quick calculations. CFM stands for cubic feet per minute, and this essentially tells you how much air can be removed from your grow tent in a minute, which is the preferred rate. First, multiply W x L x H of your grow tent which will give you the volume or cubic feet of the tent. You will use this number as your reference number and you will not want a fan with a lower CFM rating. We recommend doubling the cubic feet of your tent to get your extraction fan’s CFM rating – especially when using carbon filter as they may lower your exhaust fan’s moving capability by 30%. So, a grow tent that is 60 cubic feet will need an extraction fan that has a CFM rating of 120. If you want to learn more about setting up a ventilation system in a grow tent, check out our full guide on grow tent ventilation. What is the best grow tent? Want to learn more about grow tent growing? We have an entire section devoted to helping those growing in tents in our learning center! Not sure which grow tent is right for you? Our expert growing staff will answer all your questions at 888-815-9763!